The total fields will be displayed only when the Grid application is using at least one Group By. The settings below only can be applied for the Grid totals. Results in a single line. : This option sets the display of the General Total title and its results in a single line. Display Total : This option indicates in which pages the General Total will be displayed. The options are: On every page, On the last page or Do not display. Group Subtotal : This option defines where the subtotal group by will be displayed. Record Count : This option allows you to view the amount of records by the General Total title. Setting of display of the subtotal group. Label - This field sets the Label for the Group Subtotal. Display - This option sets if the Group Subtotal it will be display. 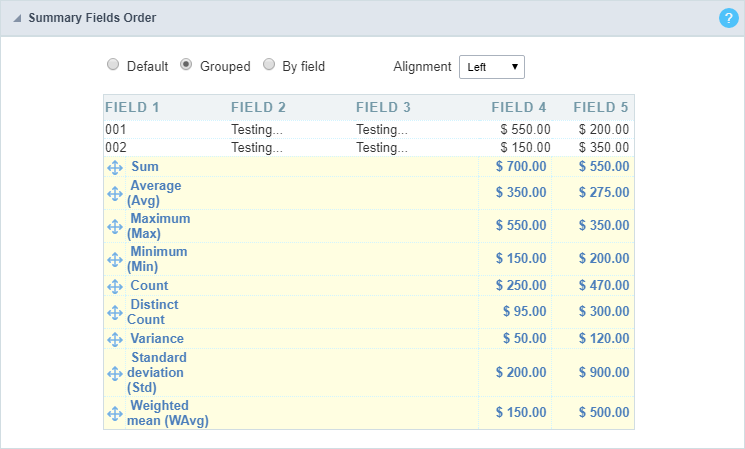 Using the select fields area you can set the total fields ant the total options for each field. The same field can be used more than once in the Grid totals area, just if they are using different summaries types. To define the fields that will be used for totals, drag them to the area, Grid Totals. 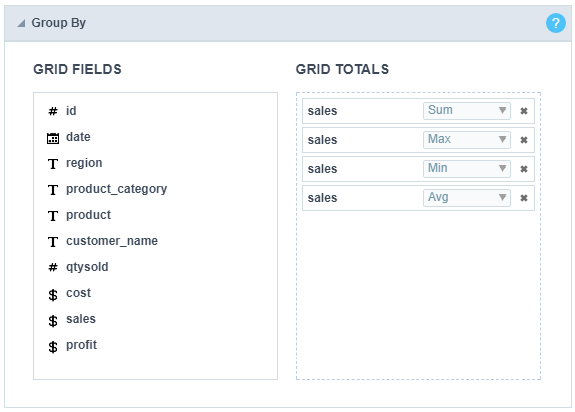 Note: The total fields will only be displayed if they are also selected to be displayed within the Grid application module. When positioning the fields, you must define what summarization will be used, to select that you must click in the combo box and select one of the available options, that will be according to the data type (integer, date, text…). Sum : Sets a sum of the values for the selected field. 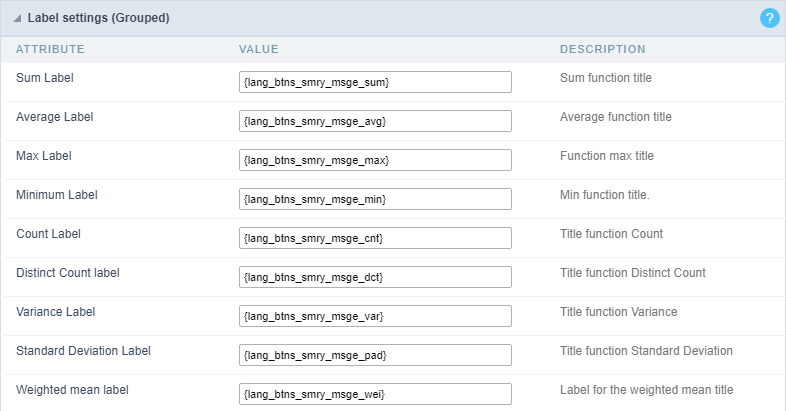 Maximum : Displays the highest value identified in the selected field. Minimum : Displays the lowest value identified in the selected field. Average (Avg) : Calculates the arithmetic mean of the values for the selected field. Variance : Calculates the dispersion of the values related to the average. Standard Deviation : Measures the variability of values around the average, the minimum value of the standard deviation is 0 indicating that there is variability, i.e. that all values are equal to the mean. Weighted mean (WAvg) : Calculates the weighted average for the selected field. 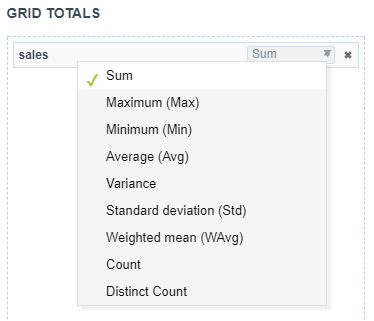 To set the weight used in the calculation of the average access field settings selected in Totals > Fields (select the field where you are using the Weighted mean) > Weighted average weight. Weighted average weight : Field that will be used as weighted average weight. In calculating the weighted average, each set value is multiplied by its “weight”, that is its relative importance. Count : Displays the total number of records for the selected field. Distinct Count : Displays the total number of records for the selected field, distinguishing the values. Important note: The fields in the Grid totals are displayed only on Grids with no Group by or with empty Group by. To add the same field two or more times in the Totals or use different types of summaries in selected fields, this option will not be displayed. The option Default returns the result below the column being summarized. When you use the total for more than one column of the Grid, using the same type of summarization, the results are displayed on the same line. The line with General Total displaying the Sales. This option is available for display formats Default and Grouped. This option allow you to customize the total labels. The option Grouped returns the total result, separating each type per line. It is possible to position the total lines by dragging to the desired position. In this example, we are displaying the sum, average, maximum and minimum of column Sales. This option displays the values in the left corner by positioning the results next to each other. This option sets the total fields display. If selected it shows the fields in the same row or divided by line. 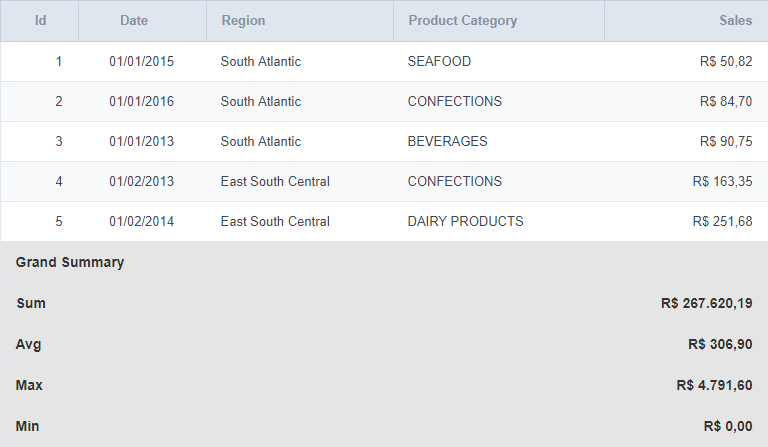 This option allows you to configure the display of values and labels of the selected fields in the Grid totals. Sets the formatting of the fields displayed in the subtotal for the group. Font family : Sets the font used. Font size : Sets the font size. Background color : Sets the background color. Bold : Format text in bold. Sets the formatting of the fields displayed in the General total.